What do Ani DiFranco and William McKinley have in common? Typically, it seems as if streets are named in memorial after people have died. Unless, of course, you’re one of the richest men in the city, or you use a street as your cow’s shortcut. Sometimes, people are honored even before their deaths. 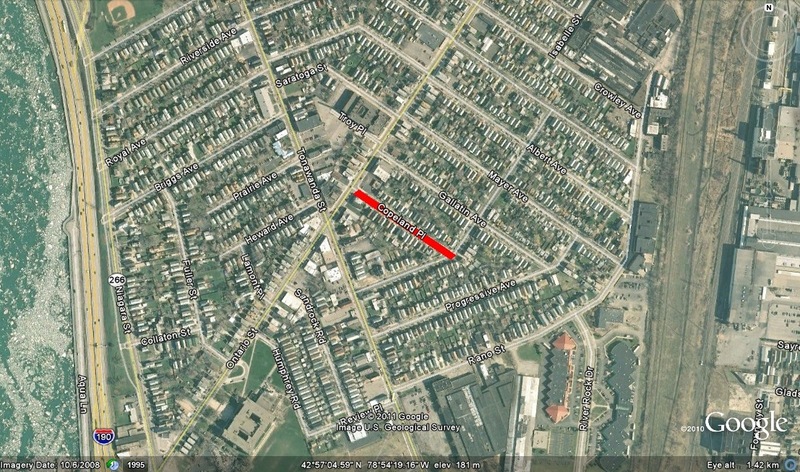 Copeland Place is a short, less than a tenth of a mile, road near the intersection of Ontario and Tonawanda Streets in the Riverside Neighborhood of Buffalo. What an honor and surprise it must have been for Copeland Place’s namesake to be called into a real estate developer’s office and see his name place on a map! Copeland Place is named for Rev. D. Benjamin Copeland, pastor emeritus of Richmond Avenue Methodist Church. Rev. 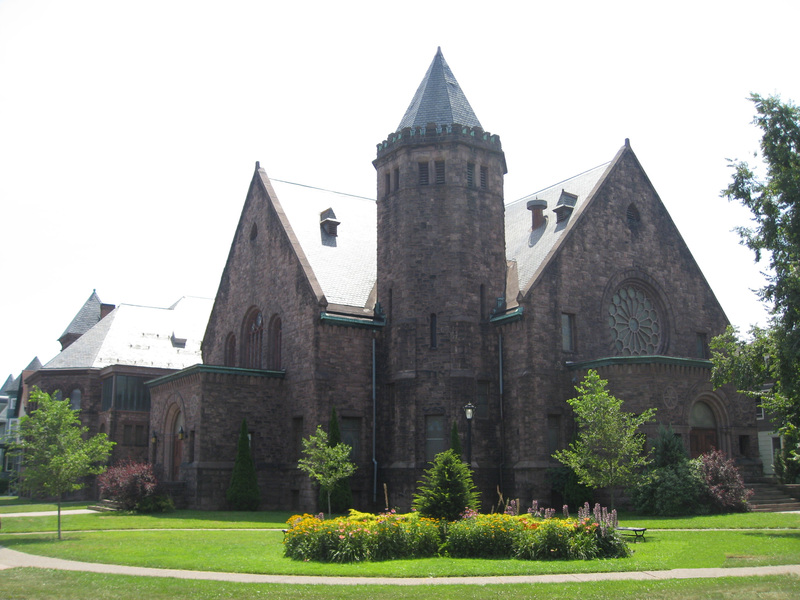 Copeland was very important in Buffalo – he founded three methodist churches – Richmond Avenue Methodist (see photo), Ontario Street Methodist, and Central Park Methodist (on Beard Avenue). He also built two other churches – Trinity Methodist (on Main at Masten…now known as Lincoln Memorial United Methodist), and St. Lawrence Chapel (the original home of Central Park Methodist). Syracuse University bestowed upon him the degree of Doctor of Sacred theology. He retired in 1919, but was still active in the Buffalo community. He was still visiting the hospitals and shutins at the age of 88 in 1938! Apparently, real estate developers were developing some of the streets in the area near the Ontario Street church he founded and decided to name Copeland Place in his honor. They surprised him by calling Dr. Copeland into their offices and asking him to look at a map. He was also a poet, and wrote several hymns for the Methodist church. He also wrote books of poems, including this one, titled “Hail to the Cheif” which was written for President William McKinley’s arrival at the Pan-American Exposition on Sept 3, 1901 (as most of you probably know, McKinley was shot at the Pan-Am on Sept 6th and died on Sept 14th). The Town we love, the Empress of the Lakes ! One country dear, one hope, one destiny ! Admire with us the President, the man ! Shall feel anew their noblest aims increased. City of Light! Crown-jewel of our fame! Of grateful joy and patriotic pride. Manila’s bay and Santiago’s shore ! To God’s sole praise, the matchless miracle. And justify the name American ! The Exposition stands for brotherhood. The Tower of Light ! Niagara’s flood in flame ! The boundless empire of the Prince of Peace! Dr. Copeland seems like he was a pretty awesome gentleman. He died in 1940. You can find his entire book of poems in google book form, here. Sources: “Copeland Place Honors Methodist Clergy’s Dean”. Courier Express November 27, 1938. Clipping found in BECPL Buffalo Streets Scrapbook, Vol 2. Copeland, Benjamin. Niagara, and Other Poems. Buffalo. The Matthews-Northrup Works. 1904.